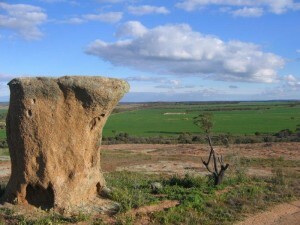 Bencubbin is located three and a half hours’ drive northeast of Perth in the centre of the northeastern Wheatbelt. Sandalwood cutters were in the area as early as the 1860s and a sheep station was established in 1867. The first farm land was taken up in 1908. The area is primarily devoted to wheat, coarse grains and sheep farming, although some farmers have diversified into cattle and pigs. Bencubbin is on the border of wheat and station country. This contributes to the wonderful variety of beautiful wildflowers and bird life found throughout the shire. Birds are numerous all year round, and the stunning wildflower season lasts from June until October. There are many varied points of interest, all serviced by good roads. Bencubbin, has a meteorite named after it. It is a type of carbonaceous chondrite but has now been given it’s own class of meteorites, the Bencubbinites. This is the type specimen. Bencubbin was found in West Australia in July of 1930. Two large stones were found. Most of this meteorite is in the Western Australia Museum in Perth, so very little has ever been available to collectors. Bencubbin II was found in 1959 by Fred Hardwick during ploughing after scrub rolling three quarters of a mile north of Bencubbin I. Bencubbin II was cut and polished by the Smithsonian Institute in the USA, the main mass can be seen at the Museum of WA. A piece of this meteorite can be seen at the Shire of Mt Marshall office in Bencubbin. 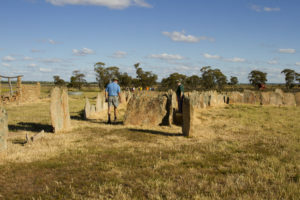 There are a number of interesting places to visit while in Bencubbin, Marshall Rock was discovered in 1836, and provides 360 degree views of the surrounding productive cropping land, Lake McDermott, Bencubbin, Welbungin and Wiacubbing Hill. Pergandes Sheep Yards and Homestead is two kilometres south of Marshall Rock, the Pergandes family sheep yard and Homestead were constructed almost entirely from granite taken from nearby outcrops. Pioneer Wells allow you to take a trip back in time, to help you imagine how families carted water from these wells for their livestock and for personal use, before the establishment of the water pipelines. The wildflowers in Bencubbin are spectacular, when there are good winter rains, the district blooms with wildflowers. Between July and October experience the diverse range of flowers. Opening Hours: Tuesday to Saturday 7am to 6pm; Sunday 7am to 3pm. Opening Hours: Monday to Friday 9am to 5pm; Saturday 9am to 12 noon. Opening Times: Monday to Friday 9am to 5pm; Saturdays from 9am to 11am. Sovereign and BP fuel card facilities available. No Gas. Eftpos available.